Today we are celebrating Epiphany. 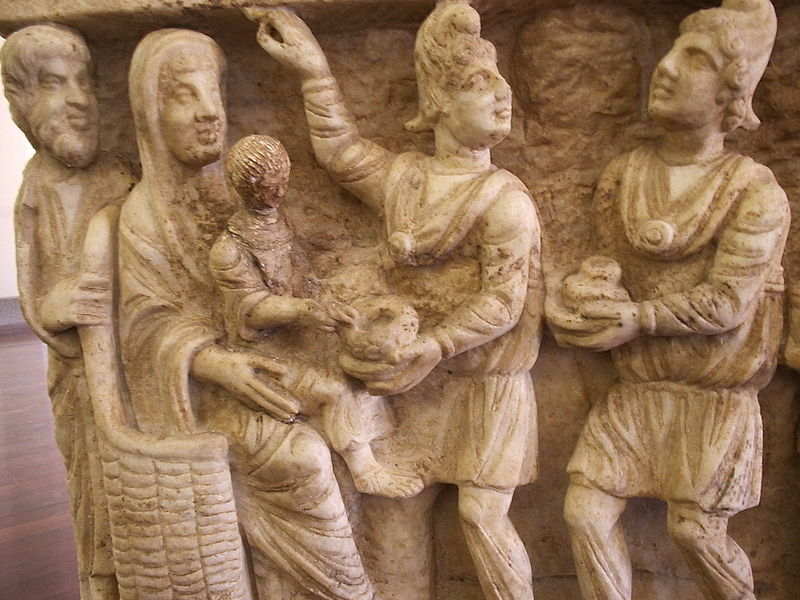 This is an ancient Christian celebration, dating at least as far back as the 300’s. And it is the day we celebrate the arrival of the magi, or the Eastern Wise men who came to visit Jesus, Mary, and Joseph. January 6 is the actual feast day of Epiphany, which is also, if you count it up, the 12th Day of Christmas. This word comes to us almost directly from the Greek. “Epi”, meaning ‘on’ or ‘upon’, and “phaneros”, which means ‘visible’, ‘apparent’ or ‘manifest’. So, an epiphany is more than just a “lightbulb” moment, or an “aha!” moment. An epiphany is something that is revealed to you. Something where light shines and makes something clear and manifest. 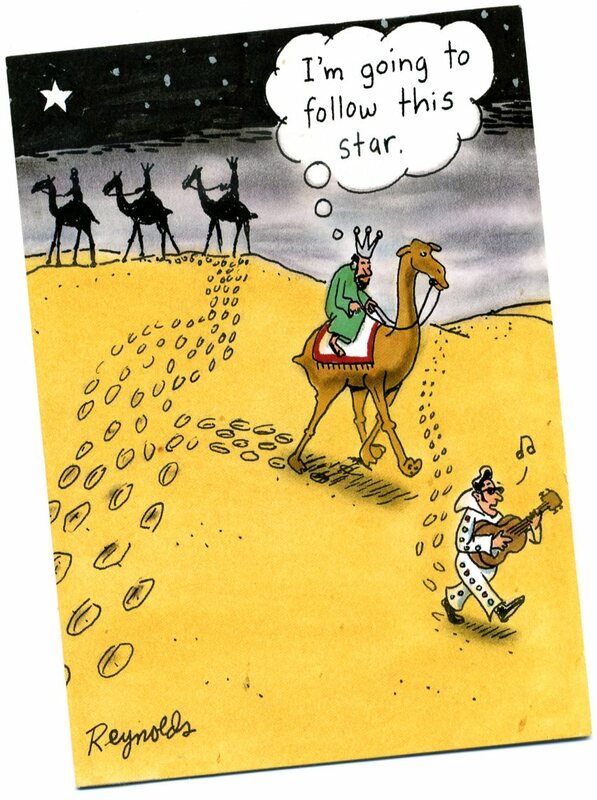 The magi received the epiphany for all of us. They saw God made flesh and saw salvation for all people. So, we have this text from Matthew about visitors from the East. Yet we don’t know much about them. Here’s an image that you have likely seen on Christmas cards. Here is an image of 2 men visiting Jesus. It is on a sarcophagus at the Vatican and dates from the 3rd century. I like this one because the baby Jesus clearly wants to get his toddler hands on those presents. 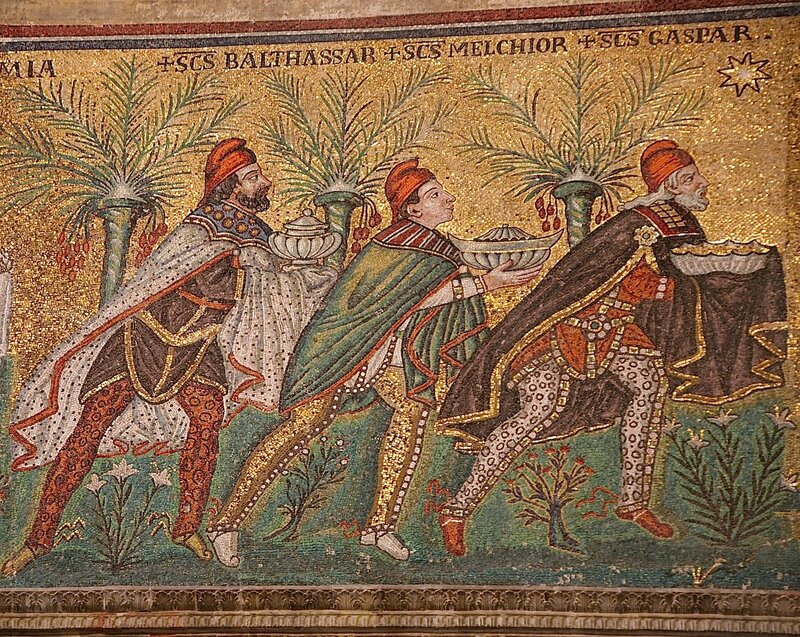 This next photograph (photo credit to Nina Aldin Thune, at the Basilica of Sant’Apollinare Nuovo in Ravenna, Italy) is from a 6th century mosaic in Italy, which suggests that the names of the magi had been attributed early on. There they are at the top—Balthasar, Melchior, and Gaspar. The Greek text just calls them “magi”, which referred to a caste of astrologers in Zoroastrianism, a religion in Persia. The word “magi” is where we get the word “magic”. The biblical text doesn’t give us their names and we don’t know how many of them there were. Their story is not related in any of the other gospels. Mark and John don’t talk at all about Jesus’ birth or childhood. Luke, in the texts we have heard the past few weeks, tells us about Bethlehem, the star, and the shepherds, but he makes no reference to the visitors from the East. Only Matthew gives us this story. And while Matthew and Luke as Gospels share some similarities, they are very different in their birth narratives. Matthew begins his with the genealogy of Jesus. He barely makes reference to the actual birth—no stable, no Roman census, no shepherds. In Matthew there is no reference to Nazareth as the home of Mary and Joseph. If you read further ahead in Matthew, the family will re-settle there, but only after fleeing to Egypt. The magi come to visit them at their home in Bethlehem, when Jesus is about 2 years old. Neither Matthew nor Luke, of course, make any reference to Elvis, but I think this is a question worth pondering. Which star are we following? No, they had been studying the star charts, and had been reading prophecies, and they had prepared for that moment. So, while God can make Godself manifest to people in many ways, for the magi, they were present for the epiphany, for the revelation of Jesus as savior of the world, because they’d been studying. So, if an epiphany is something you think you could use in your life right now, let me make a not so subtle connection. It might not happen if you just sit around. It might involve you studying and preparing for it. 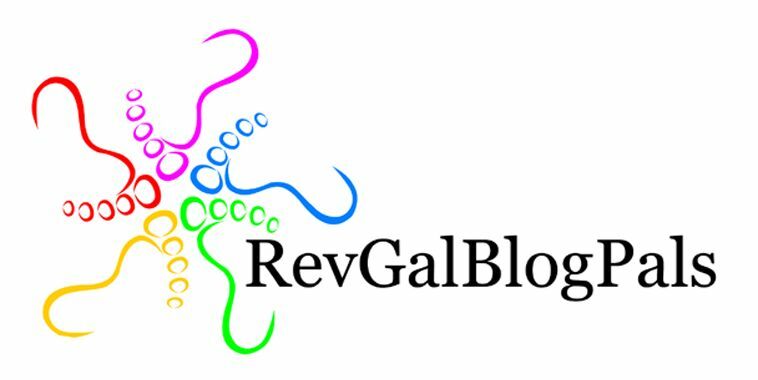 I know that some of you are involved in regular Bible study—either through Presbyterian Women, or the Sunday morning or evening classes. But this church statistically has a low participation in Adult education. You don’t have to be studying here, but I hope you are studying somewhere. And I hope you have opportunities to study with others. 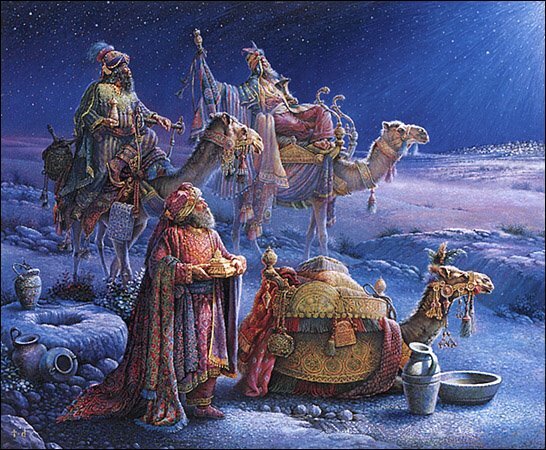 While we don’t know how many magi came to see Jesus, we know it was more than one. Studying in community can be a great experience. This coming year, we’ll be beginning new opportunities for small group participation, Sunday morning classes, and other things as the interest surfaces. Please consider joining. And while the magi studied and prepared so that they’d be in the right place for the epiphany, they did more than just study. If looking at their star charts was all they did, they wouldn’t have seen Jesus. Study will only get you so far. After study, you have to go out into the world. Study prepares you for what you encounter in the world. And the magi encountered quite a bit. They left Persia and journeyed to Jerusalem. They met King Herod. They went to Bethlehem, where they, like the shepherds in Luke, saw the star stopped over the family and they bow down and worship him. Persian astrologers bowing down before a poor Hebrew baby. Quite a change, I would imagine, from their routine at the university. But, of course, the epiphany was only the beginning of the changes for the magi. And not all changes are easy. The epiphany of a child born as king in Bethlehem shook the palace in Jerusalem. The world responds when God breaks into the world—and it isn’t always peaceful. I invite you to read ahead in Matthew this week and see how the powers of the world responded to the epiphany. We don’t know what happened with the magi, but we do know that once you encounter Jesus, you travel on different roads. Epiphany is about God coming to us in ways we would never have predicted on our own. Because, really, if you can come up with the idea on your own, then what need do you have for epiphany? And, post-epiphany, you don’t travel the same roads, you go home by another road. For Americans who are becoming more and more accustomed to maps, GPS navigation, On Star technology, and cell phones, we don’t, perhaps, still have the same level of anxiety about setting out on new and different roads. If I get lost, I am fairly confident that I’ll be able to call for help. So, to make the image work, perhaps we should consider other metaphors. We are at a New Year. While the pundits are making predictions for 2009, we too are wondering where this road will lead. Will we have peace in the Middle East, or just more and more bloodshed? Will the economy rebound quickly? Will things be different with a new administration in Washington? Will I keep my New Year’s resolution for more than a week? 2009 is another road and what is around the corner remains to be seen. As we journey into the coming year, we will, like the magi, be “going home by another road”. One we’ve never traveled before. I look forward to traveling down it with you, thankful that God has put us together in this time and place to be magi together. What star will we follow as we journey? How will we prepare?